You’ve never seen anything like Anthony Laye. 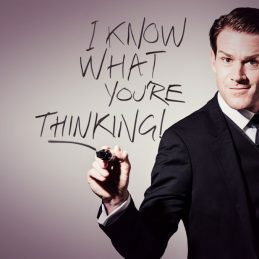 Australia’s premier mind reader Anthony Laye offers a mind-blowing experience, full of laughs and wonder. With a show that is as dynamic as it is powerful, his presentation will leave you wondering if you’re the only one in control of your thoughts. Combining wonder and laughter, amazing mind tricks and even a human lie detector test, Anthony takes every audience on a unique trip they will never forget. He even puts his influence powers to the test in a breathtaking game of Russian roulette with industrial nail guns – performed on Australian TV as part of the 2012 series of Australia’s Got Talent – and a show finale that will leave the audience in rapture, given the opportunity to make an impossible prediction a reality. Anthony is part of the international magic spectacular ‘The Illusionists’ and makes regular television appearances. The impact he will have on your audience, and your mind, can’t be explained, but must be experienced. Anthony is also an in demand keynote speaker. If you’re in business, you’re in the business of people, there is no one that knows how to get into the mind of people better than Keynote Speaker, Anthony Laye. This is a unique keynote experience. An entertaining guide through, leadership, influence, communication, career growth, networking tools and strategies, presented through live demonstrations of mentalism, engaging the audience by emotionally connecting and anchoring the lessons in to their minds. Regarded as one of the worlds leading Mentalists, Anthony has created a life and business on his terms. His success is no accident, Anthony has used tools and strategies to create opportunities, stay result driven and make the right connections.